When Tim Cook first introduced the iPad Pro he called it the clearest expression of Apple's vision for the future of personal computing. But that clarity seems to have taken some time to achieve. For years, it felt like a great debate was going on within Apple: Should iPad stay the simple, incredibly approachable appliance that empowered hundreds of millions of people to make it their first effective computing experience? Or should it become sophisticated enough that even long-time computer users can fit their workflows to it? And, if the latter, should it do so by becoming more like the Mac, or by becoming something different — something next? My argument has always been: Let iPad be iPad. Forget the Mac, forget the PC. Unconstrained by Intel, AMD, or Nvidia, unbound from decades of comp-sci cruft, make iPad the best computing experience possible, period. Apple took a step in that direction with the first, 12.9-inch iPad Pro, though the company seemed unwilling to commit to better camera systems at the time. Apple took a leap with last year's 9.7-inch iPad Pro, though it seemed stuck on the original display size. And the two models were so different you basically had to choose between a larger screen and a better screen, faster data transfer and charging or sharper cameras. Now, with the 2017 iPads Pro, Apple isn't just stepping — it's dancing. To jazz. Willing and able to question everything, improve everything, we now have two machines identical in every way but size — including one with a new 10.5-inch display— cameras as good as the latest iPhone (if not the latest iPhone Plus) and screen technology that's significantly better. Then there's iOS 11, previewed last week and coming to iPad Pro this fall. It promises as big an advance in software as we're already getting in hardware. Are the new iPads Pro compelling upgrades for existing iPad owners, especially existing iPad Pro owners? Should Windows ultrabook and laptop owners seriously consider cross-grading? Should MacBook and MacBook Air owners start looking for what's next? 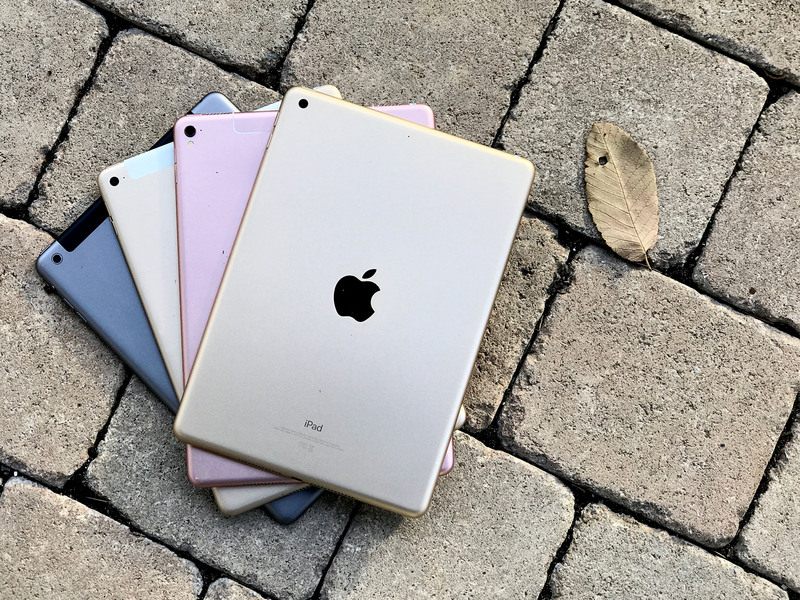 Along with my colleague, Serenity Caldwell, I had a chance to try out both the new 10.5-inch and the updated 12.9-inch iPads Pro following Apple's WWDC 2017 keynote. Since then, I've been using a 10.5-inch iPad for about a week. Typing on it. Drawing and compositing on it. Gaming with it. Taking photos and filming with it. Reading and watching on it. Traveling with it and using it in coffee shops on both Wi-Fi and LTE (roaming with a Rogers SIM). In other words, living with it. And yes, that includes writing this review on it. The new 12.9-inch iPad Pro has gotten a major upgrade thanks to a significantly better display, processor, and camera system — even if it's still lacking a rose gold color option. The new 10.5-inch iPad Pro may seem like a smaller upgrade, but offers a larger and better display, more powerful processor and camera system, and faster data transfer and charging options. iPad Pro isn't for those who want a cheap video or gaming tablet, or for people who still need to run macOS or Windows. More than ever before, though, iPad Pro is for everyone who wants a cutting-edge, touch-native, incredibly accessible, privacy-and-security first, powerhouse of a personal computing experience. And one that's going to get even better this fall with iOS 11. The original iPad shown off by Steve Jobs in 2010 had a 9.7-inch display and so has every standard-sized iPad since. iPad mini might have gone smaller; the first iPad Pro might have gone bigger. Up to and including the fifth generation iPad introduced early this year, though, 9.7-inches has been the sweet spot. With the second generation iPad Pro, Apple is keeping the larger 12.9-inch display size that was introduced in the fall of 2015 but replacing the 9.7-inch iPad Pro from 2016 with a new 10.5-inch version. And, what a difference those 0.8-inches make. You don't really notice it at first. Especially if you don't have a 9.7-inch iPad laying around to compare it to. All that stands out are the thinner bezels. Once you've used it for a while, though, the difference becomes evident. Especially if you try to go back to 9.7-inches. At the risk of making a terrible analogy, it's like getting a new pair of your favorite shoes that are just a quarter size bigger. They feel incredibly comfortable and then, when you slip the old ones back on, you realize they've always been just ever-so-slightly tight. With the 10.5-inch iPad Pro, the canvas is just a little bigger. The keyboard is just a little more spacious. And even though it's only a little, when you use it all day, every day, a little adds up to a lot. What the difference is not is big enough to give you full-sized iPad apps (regular size classes) in 50/50 mode. That means you still get iPhone-style apps (compact size class) like on the 9.7-inch. It makes navigating in-app slightly slower but content in apps bigger, which I've come to conclude is a fair trade off. I like that Apple was willing to make this change. Some might think 9.7-inches was the ideal, set in stone since the origin of iPad, absolute and unchangeable. Apple seems to understand that the ideal is the ideal, and that it has to change and evolve given the needs and technology of the time. That's what Apple's done now, and iPad is better for it. Retina high-density on iPad 3 was enthralling. Pixels disappeared and all you saw were glossy photos and crisp, sharp text. DCI-P3 wide color gamut on iPad Pro 9.7 was engulfing. Reds, magentas, even purples and greens, were so deep, so rich, you felt like you were falling into them. True Tone, also introduced with iPad Pro 9.7, was soothing. Dynamically adjusted white balance matched ambient room temperature, removing overly cold blue or warm yellow casts and making the display look more like paper. And now they've gotten better still, thanks to two new technologies. The first is a new level of brightness — 600 nits. That's a 20% increase over the previous 9.7-inch model and a 50% increase over the older 12.9-inch model. Combined with an anti-glare coating that reduces reflectivity down to just 1.8%. Even better, it enables real high dynamic range (HDR) for video. HDR is a concept most of us are already familiar with from photography. The gist is, with HDR you don't have to choose between blowing out the highlights or muddying up the shadows. You get more detail in both the bright and the dark. Higher-end televisions and some other mobile devices have begun offering HDR alongside 4K, but many of them have lacked the brightness levels to really show it off. Unfortunately, there's precious little HDR video available to watch on tablets at the moment. Last year, though, I was able to watch a Dolby comparison of The Force Awakens in 4K vs 1080p HDR. The HDR version, despite being lower resolution, blew away the 4K version. The difference was eye-popping. That's why I'm happy Apple is offering the support now so that, as the content begins to flow faster, we'll be all set to enjoy it. The second new display technology on the iPad Pro is ProMotion. Apple's brand name for up to 120 Hz adaptive refresh rate, it lets the display ramp up to 120 fps for tasks like drawing with Apple Pencil, so you get ultra-low latency — 20 milliseconds! To the right, you can see an example of Apple Pencil on the old iPad Pro (left) and new iPad Pro (right). It's the adaptive part that's both so cool and so important. The 9.7-inch iPad Pro introduced variable refresh, which could ramp down from 60 Hz to save power when the higher refresh rate wasn't needed. Adaptive refresh can do that too — but it can also ramp up. That's important, because 120 Hz takes more power. So, mixing it up with 30 Hz or even 24 Hz when you can balances things out and helps iPad Pro retain it's Apple-estimated 10 hours of battery life. So, glee-inducingly, iPad Pro can do things like showing you a 24 fps moving in one split view pane while pushing the other at 120 Hz for scrolling or drawing. (Because, math; specifically division.). You can see an example to the left, though neither GIF nor other displays can really render the 120 Hz experience. What it does is totally avoids the "soap opera effect" you typically see when forcing 24 fps cinema into TV mode, and the "motion smoothing" nonsense that TVs try to sell but many of us turn off the moment we get them home. Combined with True Tone, laminated panels, Retina, DCI-P3, HDR, and the raw speed of iPad Pro, it makes not only the display but everything on it closer to a moving magazine than anything I've seen before. Once you see video playing, Pencil drawing, and even text scrolling on the new iPad Pro, it's really, really hard to go back to any less advanced displaying. And that's always one of the best tests for any new technology — how much you miss it when it's gone. The new iPad Pro has the new, faster, second-generation Touch ID sensor originally rolled out with iPhone 6s and later added to the 2016 MacBook Pro. It's roughly twice as fast as the original so you can unlock your iPad Pro, open apps, authenticate your identity, and authorize transactions sometimes even faster than you realize it's happening. It's still a physical button, though, not a virtual one like on iPhone 7. And... it feels weird to me now. The brain is a strange and wonderful thing and once it resets what it considers to be normal, everything that came before is suddenly... not. Absent 3D Touch and the Taptic Engine (see above), there'd be no way to make the iPad Pro Home button virtual in the same way as iPhone 7. Still, after 9 months of using the virtual one, I want it everywhere. Consistency is a user-facing feature. So, it does make me wonder just how long it will take until Apple starts to virtualize all buttons on all devices. It would cut down on mechanical failure and open up the hardware to more diverse, more flexible control possibilities. A10, introduced with iPhone 7 last fall, is a "fusion" processor. (Don't call it LITTLE!). It fuses a high-performance core with a high-efficiency core. That lets it handle demanding tasks blazingly fast without sacrificing battery life on the less demanding tasks. iPhone 7 had two fusion cores. The new iPads Pro have three. According to Apple, it makes A10X 30% faster than the A9X found in the original Pros. It also has a twelve core graphics processor, 40% faster than A9X — all while maintaining the same 10 hours of battery life mandated for iPad since the original. I haven't had time to put the new iPads Pro through the battery ringer, but the 10.5-inch model running iOS 10 has been more than fine during Apple's typically taxing Worldwide Developer's Conference (WWDC). The speed, though, is apparent. You can feel it in everything from switching apps to scrolling web pages. It's even more shocking when you think your colleague, Serenity Caldwell is exporting images only to find out she's exporting videos faster than you would have previously thought possible. What's more, Apple's shared memory architecture — and yes, tangent, 4 GB on both models this year — and Metal frameworks let apps target that power in a way tradition, split, desktop CPU and GPU architectures can't. Apple says it makes iPad Pro more powerful than many PC laptops. I'm sure it's more powerful than some but to me it's really something different entirely. Old Intel architectures feel like massive transport planes. iPads Pro feel like drop ships out of sci-fi. I've been incredibly impressed with the work of Apple's silicon team since they were the first to jump to 64-bit on mobile with the A7. Their multi-threaded performance is always more than competitive, especially core for core, but their single-threaded performance is increasingly unmatched, and that's vital for things like maintaining responsive interfaces and the feeling of direct manipulation. I rarely if ever saw any apps peg the A9X. I've only ever seen Portrait Mode and maybe some incredibly intensive photo filters peg the A10. I don't know what it would take to peg the A10X. But I can't wait to find out. iPad Pro can still do 802.11ac, multiple-in, multiple-out (MIMO) Wi-Fi at up to 866 Mbps. LTE, though, has gotten better. Apple SIM is still included, of course, but now there's support for 25 bands at up to 450 Mbps. That's two additional bands and 150 more Mbps than last year's 9.7-inch iPad Pro. In other words, you can use iPad Pro on LTE in even more places, at even higher speeds than ever before. Best of all, Apple's doing all of this on a single modem, not two different modems like iPhone 7. That means, as long as you buy an LTE iPad Pro, you can use it on Verizon and Sprint in the U.S.A, or any GSM carrier around the world. I suspect we're all paying a hefty Qualcomm tax for that privilege, even outside the the U.S., but the simplicity is nice all the same. * For the smaller iPad Pro, that is. Excitingly, the new 10.5-inch iPad Pro can now do fast USB-3 data transfer and fast USB-C power charging, just like the original 12.9-inch model could. Not having those features on last year's 9.5-inch iPad Pro was vexing, so I'm glad Apple corrected for it. I'm less glad that you have to buy the USB-C charging adapter separately. Including it in the box would make iPad Pro feel even more "Pro". Also, given what can happen with shipping schedules, it was sort-of understandable when the September 2016 iPhone couldn't plug (straight out of the box) into the October 2016 MacBook Pro. It's less understandable when the June 2017 iPad Pro can't. If Apple can go USB-C only on laptops, it can and should go USB-C, with adapter, in the iPad box as well. Consistency is a user benefit. With the Lightning to USB 3 adapter, you can also plug in USB-A keyboards, microphones, Ethernet adapters, and more. Which is great, because you only get USB 3 transfer speeds with the Lightning to USB 3 and Lightning to SD adapters, not with the Lightning to USB-A or USB-C cable. It's a bit of a bummer. I'd have loved it if the Lightning to USB-C cable could handle USB 3 speeds straight to my MacBook Pro. One of the most disappointing aspects of the original 12.9-inch iPad Pro was its anemic camera system. When I first heard about a display that size and chipset that powerful, I thought I'd be getting the 4K viewfinder of my dreams. Apple seems to have agreed and, with the 9.7-inch iPad Pro, the company brought the first really modern, really good camera system to an iPad. You easily see the difference on the back of the 10.5-inch iPad (middle) compared to the old 12.9-inch model (bottom) and old 9.7-inch model (top). Thankfully, the second-generation iPad Pro not only brings an even better camera system to the new 10.5-inch model, it brings it to the 12.9 as well. For anyone who wants to both ingest and edit video natively on the biggest iPad Pro, the cameras alone make the upgrade worthwhile. The new camera system is the same one found on iPhone 7. Not iPhone 7 Plus, mind you. 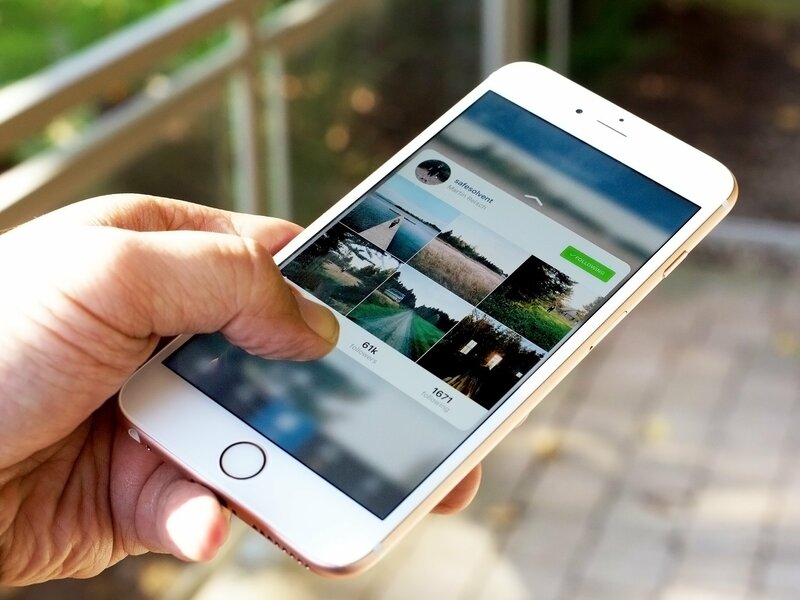 There's no second, "telephoto" lens, which means no optical zoom, no Portrait Mode, and no computational photography to come that depends on data pulled from dual lenses. There is a 12-megapixel sensor that can capture in DCI-P3 wide color gamut, the ability to stitch together 63-megapixel panoramas, and the ability to shoot 4K (2160p) video or up to 240 fps slow motion. On the hardware side, it's got hardware optical image stabilization (OIS) for better low-light and steadier video, and a quad-LED flash for better temperature matching and more accurate skin tones. Thanks to the image signal processor (ISP) in the A10X, it's also got faster focus, better local tone mapping, and more accurate white balance. All of that translates into clearer, steadier, more natural looking photos and videos. And with the giant 10.5 or 12.9-inch viewfinder, you can make sure whatever you want to shoot is framed perfectly and the focus is tack sharp. Same with the front-facing camera. It's 7-megapixels now, also DCI-P3 wide color, and offers about the biggest Retina Flash experience you can imagine. I don't know what the hold up is with FaceTime conference calling — whether it's the endless patent lawsuits Apple is going through, or they're working on something even more forward thinking and functional to replace FaceTime — but these displays and cameras are begging for it. WWDC 2017 kept us so busy we didn't have time for a full-on camera shooting showdown — we'll get to it soon, though! — but I did spend a couple days shooting with the 10.5-inch model around the San Jose area. And I was smiling constantly. iPad Pro can use any of the hundreds of thousands of tablet-optimized apps in the iOS App Store. It's a number so large that quantity alone can no longer be used as a measure. Only quality. Luckily iPad has been pushing the state of the app art since it was introduced, with iWork and GarageBand showing early on just what big screen mobile apps were capable of achieving. Since then, iPad has gotten apps from Google, Microsoft, Adobe, and a strong group of indies who can and do often code circles around the major players. The trick, as ever, will be sustainability. Can iPad apps that take full advantage of everything the A10X and ProMotion have to offer, including new frameworks like ARKit coming with iOS 11, reach and keep enough of an audience, at enough of a price point, to stay viable? Affinity Photo, announced alongside the new iPad Pro, is a great example of something that might only be possible at its current level of polish and performance on iPad Pro. It lets you finger or Pencil paint with distortion waves and feather mask with a swipe, all for just $20. For accessories, there's a new, roomier Smart Keyboard for the new, roomier 10.5-inch iPad Pro. 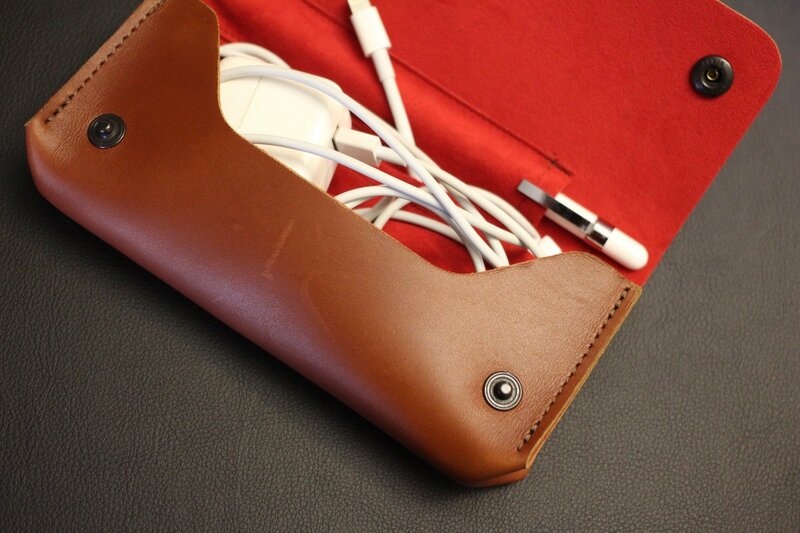 There's also a new Leather Sleeve with Apple Pencil holder on top. The Sleeve isn't for me. I find it too long and I'd rather have the Pencil on the side than on the top. I haven't had a chance to try the new Pencil Case, which sleeves only the Pencil, but I don't think it's for me either. For those of you who, like me, were hoping for a new Apple Pencil to go with the new iPad Pro, sadly, we'll have to keep hoping. The idea of something that pairs as easily — and as obviously in the interface — as AirPods do with the W1 chip is compelling. So is some form of direct attachment and, as my colleague Serenity Caldwell is so fond of pointing out, variant nibs to better simulate different types of pens. Other than that, while you'll have to get specific cases and covers for the new 10.5-inch iPad Pro, both new models are broadly compatible with existing Lightning and Bluetooth gear, and both can connect to and control the increasing number of HomeKit accessories on the market. Apple was smart to wait and announce the new iPad Pro alongside the preview for iOS 11. If the new iPad Pro had been announced back in March, some of the conversation would have centered around the software trailing the hardware, and iOS holding back the iPad. Now it's mostly along the lines of impatiently wanting iOS 11 as soon as possible, which is a much better problem to have. iOS 11 is a huge update, especially for iPad. It brings marked improvements to the split-screen multi-windowing system, including a new, always-accessible Doc and a new App Switcher that's not only integrated with Control Center but saves all your spaces (side-by-side layouts). It also brings secure drag and drop, which prevents previewing on cross-app drag but also prevents unintentional data leakage on drag-over. Not only that, but the entire system from icon rearranging to list reordering has been rewritten to take advantage of the advances in drag-and-drop. There's new and better Apple Pencil integration, so you can start a note with just a tap on the Lock screen, and annotate everything from a screen shot to a PDF quickly and easily. Plus, you can search for your handwritten notes, in English and simplified Chinese for now, and more languages to come. Files.app, something I've been asking for since iOS 4, is an optional download that lets you browse not only your local directories but iCloud and third-party providers like Google Drive, OneDrive, Dropbox, and Box as well. ARKit will even let you layer a virtual world on top of the real one for games, education, navigation, and more. Available as a free update this fall, it'll make iPad Pro even more creative and productive. One thing that didn't get bigger with the new 10.5-inch iPad Pro is price. 64 GB starts at $649. You can also get 256 GB for $749 and 512 GB for $949. Add LTE, and those prices go up to $779, $879, and $1079 respectively. If you want to escalate to the full 12.9-inch experience, you're looking at $799, $899, and $1099, or with LTE, $929, $1029, and $1229. It makes for a more reasonable cost of entry and storage capacity at the low end even as it adds a more expensive, more expansive model at the top. All of the new iPads Pro are available to order now and should be shipping by the time you read this. It's hard not to gush about the new iPads Pro. Apple took what were already the most popular tablets on earth, by a wide margin, and made almost everything about them substantively better. The displays are even more advanced, the chipsets are even more powerful, the Pencil experience is even better, typing is improved on the now-slightly-less-small version, the cameras as impressive as iPhone 7 and, come this fall, they'll get everything iOS 11 has to offer, including Metal 2, Drag and Drop, Files, augmented reality support, Swift Playgrounds 2, and a ton more. Sure, there are a few things that still irk me — the tragic lack of a rose gold option at 12.9-inches, no second-generation Apple Pencil 2, Lightning to USB-C not being included in the box and not being able to do USB 3 speeds without an adapter, and so on. Hopefully, Apple will address all that, and more, in the next update. For now, Apple has really done what I wanted the company to do most — let iPad be iPad. Let it be that clear expression of Apple's vision for the future of personal computing. Not forced to be the same or different from the Mac but allowed to be its own thing. That's what the new 10.5-inch iPad Pro and the updated 12.9-inch iPad Pro feel most like to me — iPads set free. For those looking to update, owners of the previous 9.7-inch iPad Pro should look at the small but perhaps significant updates to display size and technology, processor, data transfer, quick charging, and cameras. Owners of the previous 12.9-inch iPad Pro should look, hard, at the much more compelling updates to display technology, processor, and cameras. For those looking to buy for the first time, if you need to run macOS or Windows, you'll still need to get a MacBook or a Windows hybrid or tablet. If you just want an easy to use entry level tablet, check out the 9.7 inch iPad (5th generation). If you want a next-generation, touch-native, incredibly accessible, privacy-and-security first, powerhouse of a computing experience, the answer has never been more clear — get iPad Pro.